Geologic sourcing of chipped stone artifacts and lithic debitage is a routine part of archaeological analysis and report writing (Figure 1). In order to do this task, a comparative collection is obviously necessary, one with solid geologic associations and an expansive geographic selection. 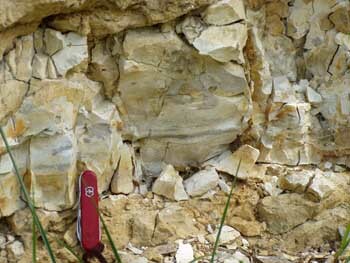 Iowa’s bedrock contains a large variety of quality, knappable, lithic raw materials from both primary and secondary sources (Figure 2). Identification of archaeological specimens with a specific raw material is primarily accomplished by macroscopic analysis techniques geared toward achieving a “best fit” results (Figure 3). The University of Iowa’s Office of the State Archaeologist (OSA) has an expansive lithic raw material assemblage with a nearly 30 year compilation history. 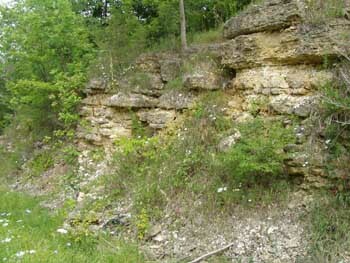 The largest portion contains multiple samples of the lithic resources from within the state while the second portion contains multiple samples from the surrounding states and numerous additional states. During the late 1990s, a revision and reorganization of the OSA collection was begun in order to provide a more systematic and consistent approach to lithic source identification. This six year effort resulted in the first version of this web site posted in April 2006. The site was updated in 2008, again in 2011, and will be periodically updated as the physical assemblage expands and our knowledge of lithic raw material resources grows.